Musthafa Ebadi - Welcome to My Website. ​Our 3rd User and Partner Conference will be held in beautiful Niagara Falls from September 25th to September 27th 2017. We all know that mobile technology is dominating our personal and professional lives, and over the next 5 year the entire workforce landscape will be vastly different thanks to the constant evolution of mobility. SOTI continues to be at the forefront of the mobility needs of our customers and partners. Our tremendous growth in the last 5 years (when most of our competition either folded or were acquired by major corporations) is an exceptional testament to our ability to produce an extraordinary product and then compliment it with an excellent service. Come and join our User and Partner conference to interact with and learn from the best mobile technology experts, exchange ideas and share best practices on common challenges in a thought provoking, fun and engaging environment. During the 3 days of our conference you will hear from our visionary CEO, Carl Rodrigues, who is disrupting the status quo with innovative new ideas that are changing the game. ​It doesn't matter what industry you operate in, mobile technology, IoT, and Business Intelligence are going to cross your path. Be there to hear Carl discuss these three key areas of technology that have come of age and are the catalysts that are driving change. He will illustrate how SOTI has weaved these pieces of technology into the SOTI ONE platform to create a fabric that allows you to be the disrupter rather than the disrupted. With a full day of hands-on training, followed by two full days of Keynotes, General and Track sessions from a wide range of industry experts, you will have the opportunity to blend technical skills against real mobility issues. You will walk away from this event with the knowledge and know-how to lead your organization in the ever-changing world of mobility. You will also hear from Yossi Ghinsberg - Adventurer, Author, Entrepreneur, Humanitarian, and motivational speaker. ​Yossi is a master storyteller with an epic story to share. He found new meaning in life after being stranded alone in the Amazon jungle. His energy is contagious and his insights mind-bending. He knows survival like no one else, and he knows why it is important for businesses to learn and embed these survival principles. Yossi advises leaders and teams worldwide on how to awaken their 'Day to Day Hero,' following a set of natural survival skills we have all forgotten that we possess. His unique insights are counter-intuitive, mind-bending and nothing short of transformational for individuals and organizations today. As part of this conference we are offering a full day of training from our subject matter experts.You will have the ability to select specific sessions catered to your individual knowledge and skill set. ​At the end of the training you will also get certified as SOTI MobiControl Associate – another achievement on your resume. We are giving away 200 brand new Android Yoga Book courtesy of Lenovo to random winners. 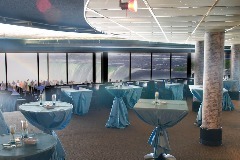 And Last but not the least you will have great fun during our Customer and Partner appreciation reception with journey behind the Falls. You will experience the Falls better than the local residents can. From exclusive private behind the scenes access of The Falls, live music, and culinary masterpieces along with a few other surprises, this is a night not to be missed. ​Please see the highlights of our last two SOTI SYNCs here. ​We have limited seats and they are selling fast. Please visit our website to register now and to not miss your chance to be part of this fabulous event. If you are one of first five people to private message me after reading this post I will give you a promo code to save on registration. See you in few weeks in the spectacular Niagara Falls! ​They say you can learn a lifetime of a lesson in few minutes. As most of you know I am a sport fanatic. What you may or may not know is that I am also a junky when it comes to leadership and management, always on a lookout to be a better manager and a better leader. I often watch sports to relax and de-stress, but also learn and grow in the process. After wrapping up at the office today I planned to watch game 4 of American League Division Series between Toronto Blue Jays and Texas Rangers, relax, and get ready for few weeks of actioned packed schedule! Like many Canadian I am a Blue Jays fan, and have to admit I was nervous about 2nd straight elimination game for them. As I sat in the car and turned the dial to the game, Chris Colabello hit a solo homerun at the bottom of the first to make it 3 -0 for Blue Jays! 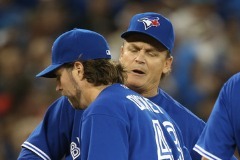 The rest of the game was what doctor had ordered, and by mid 5th inning it was 7-1 for Jays! Before I get to rest of this post let me give you some context. The Toronto Blue Jays: Started the ALDS as favorites however lost 2 home games to go down 2-0 in best of 5 series. They won 5-1 yesterday in Arlington, and today was another do or die game. John Gibbons: The team raised eyebrows on November 20th 2012 when it announced to bring back “Gibby”, as he is known, for a 2nd stint to manage the Jays. Why? In his first stint he developed a reputation of micro manager, flip flopper, playing it safe, and trying to be popular! RA Dickey: The 40-year-old 4th pitcher of the Jays rotation who became the oldest player to start a post season game in history of baseball. He was drafted by Texas Rangers, and debuted on the same mound that he would pitch tonight. David Price: The “Ace” of Toronto’s rotation! BlueJays payed a hefty price to acquire him as a "rental" player this July. The goal was to get an Ace Pitcher to guide you to post season. Price has a horrible record in post season with 1 win in 6 games – direct contrast to his unbelievable regular season record of 104 win and 56 losses. The plot: It’s a 7 -1 game in bottom of the 5th with 2 outs. For those of you that don’t know baseball a pitcher needs to pitch 5 full innings to qualify for a win. RA Dickey needs 1 more out with a 6 run cushion to get his first win of his postseason (and perhaps the only one since he is 40 years old) in the same park that he pitched his first major league ball, and now his first Post Season major league ball. In fact the day before Dickey had said how things have come full circle for him, calling it "poetic ... a neat narrative." How cool, right? ​Wrong! As soon as RA Dickey got his 2nd out of the innings John Gibbons moved to the mound to replace him with David Price, thus taking away the win from Dickey and ruling out his Ace David Price to start in game 5 of best of 5 series. I was baffled and dumbfounded about the move. I am dead tired today, and planned to hit the bed as soon as the game was done, however, after watching what had transpired I was keen to see how John Gibbons will explain his decision, and how RA Dickey will handle himself in post game media briefings. When Gibbons sat behind podium the first question he was asked was about the decision! And he handled it like a leader. He explained his reasoning which was he didn’t want Dickey to face Sin-Soo Choo and the top order of Texas especially with Choo having Dickey’s number. He said " it wasn't an easy decision...Probably not a relationship-building move, but a team win is more important and that's what I was looking for”. He was asked again and again however as a leader he explained his judgement behind this tough call and defended it! Do I agree with him? No. Do I think Dickey should have got the win? Yes. However what I learnt once again is as leaders we have to make tough decisions for the benefit of the team! It may not be popular among spectators, and fair to one or two team members however our primary responsibility is towards the team first! And when RA Dickey sat behind the podium the first questions to him was how was he feeling after not getting the win with in a 7-1 game and 1 out away. He started by saying that no competitor should be happy about getting pulled, but feels more joy about getting to Game 5. He talked about the team, how much joy there is by achieving the goal they setout 3 days ago, which was to win 2 games in Texas and bring the series back home in Toronto. He made a point to not let Gibbons decision overshadow the joy in the dressing room. Dickey did say that he was disappointed with the decision, will sit and chat with his manager at somepoint about it, however was elated that they have a shot to win the series on Wednesday. He was genuine, sincere, honest, positive, and frank about the situation. What I learnt observing him is you could be dealt the worst blow, feel cheated, and still genuinely conduct yourself as mature and selfless professional! Life isnt fair, we are put in situations we feel are uncalled for, and at times deserve better however we can still be a class act about it! He also said "It's amazing what you can accomplish when you don't care who gets the credit." And that is true character of a leader and champion! If this was RA’s last game in Major League he is going out as a champion in my books! How he handled himself, the situation, and putting the team ahead of his self interest makes him a leader! My level of respect just for him went few notches higher! We’ve all been there. A team member’s performance is slipping and needs to be addressed. How clear were you with expectations? Don’t expect an accountability conversation to go well if there is any fuzziness about what the goals were. If you have concerns, use the time to re-clarify expectations. How is your relationship with the team member? The right to be candid with a person about their performance is the byproduct of a strong working relationship featuring frequent conversations. If your relationship has been more of a “no news is good news” relationship in the past, shore that up first. Now, there are just a few more finer points to consider when delivering potentially sensitive feedback. Only give feedback on behaviors that can be changed (not on traits or personality). Feedback works best when it is focused on behaviors instead of personality traits. You shouldn’t be asking your people to make personality changes like, ”be more extroverted, or more feeling, or less linear in your thinking.” Instead, focus on the things you see someone doing, or the things you hear someone saying. Remember that people are okay—it’s just their behavior that is a problem sometimes. As a manager you need to separate the behavior from the person. Don’t be judgmental. Keep the focus on the behavior that needs to change. Say what needs to be said and let it sink in. Then reaffirm the person and move on with expectations that behavior will change and that the person is up to the challenge. Help employees monitor their own behavior going forward. Whenever possible, you want people to learn how to monitor their own behavior. Teach them how to solicit feedback and be “participant observers” in their interactions with others. Your goal is to help employees become self sufficient. You don’t want to create a dependent relationship where they are constantly looking for you to tell them how they are doing. 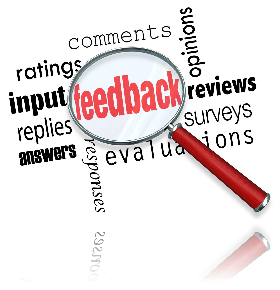 Providing feedback is one of the key ways that managers can improve performance and make things better at work. Don’t avoid feedback—even negative feedback. Done well, it will actually enhance your relationships at work. People will know you care and that their work is important. ​As usual ​feel free to agree, disagree, or share your perspective using the comment section of this post. 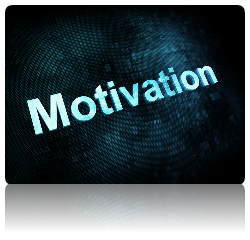 Motivations are two types: Intrinsic and Extrinsic. ​While intrinsic motivations are from within extrinsic motivation are external factors that help motivate individuals and teams. Below are the 5 albeit not expensive techniques to motivate your team or an individual . One of the best rewards you can give an employee in your office is to send them on a quick vacation. Maybe it's just a weekend at a resort across town or something fairly inexpensive. But by sending one person on your team, you are motivating everyone, because it could be another person's turn to go next time. You're creating an atmosphere of rewards. The de-motivating factor on a project could be your own presence. Maybe no one is very motivated because they know you will pick up the slack and finish everything. If you aren't around and the project depends entirely on their efforts, the team might suddenly become much more motivated--especially if they know you're not going to bail them out. A good motivator for people is when some activity that seems fairly routine suddenly turns fun. Nothing kills motivation like a promise that isn't fulfilled. Yet, you can easily motivate someone by promising exactly what you can deliver. 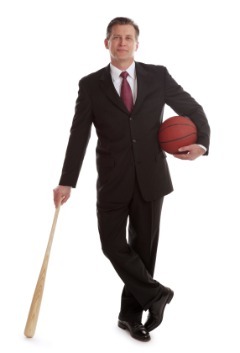 If the sales rep needs a boost and you know you can add a 5 percent bonus if he or she completes a certain objective, go ahead and offer that motivation. Take it a step further and get really specific about what the end result will be if the employee does what you are asking. The more specific you get, the more you can motivate. Don't just say there will be a bonus, say when, how much, and how often. Everyone likes being in charge--well, most people, anyway. One good motivator is to give more management responsibility to someone on your team. It's a reward that motivates because it shows you are aware of that person and their potential to lead. It helps an employee see that there is a bright future that could involve a promotion at some point. As usual ​feel free to agree, disagree, or share your perspective using the comment section of this post. Why As A Leader Its Imperative To Be Optimist! ​Over the last few years the management paradigm has shifted immensely. While the old school management was about control, intimidation, and top down communication the landscape in the last few years has evolved. Now management is about motivating, inspiring, and serving your people. I am a big fan of servant leadership concept which dictates that your primary job as a leader is to serve your people. Today's generation of workers want to be coached, developed, and motivated. They want to have open communication and a dialog with their manager. While as managers we still have to hold them accountable we can only succeed if we set proper expectations, communicate those expectations, and review them periodically. This type of leadership mentality is something that we have to learn over time and for those who were trained with old style of management its a major under taking to make the change. The prerequisite of this change is believe. Believing that this is the right approach, right philosophy, and the right style of leadership. You cannot fake your way through it. The other attribute that your people expect to see in you as their leader is to be a force of optimism. Staying positive (for most part) is very important to have a high caliber team. Your team looks at you every step of the way and as someone who is positive, enthusiastic, and energetic you will be able to infect them the same way. Remember that both optimism and pessimism are contagious. And when you have a team of positive people you will notice the difference in level of performance. It will also make it much more easier for you to motivate and inspire your team with your strategies and vision. If you are not positive as a leader your knock the wind out of the sails of your team. No matter how hard you work or what else you do lacking optimism and enthusiasm will not yield you high results. And for you to stay positive and energetic you need to be happy with what you do, love your circumstances, and the environment you are in. Are you? If not then thats where the change needs to start. ​Feel free to agree, disagree, or share your perspective using the comment section of this post. Our primary job as people managers are to have a highly motivated team of employees who can serve our customers with passion who ultimately pays our bills! There have been many good and some great articles on how to keep your employees motivated by various leadership Gurus. Recently I came across this article by Martin Haworth. When I went through his post I thought that he had captured it pefectly. I have been able to incorporate few of it in my own day to day style and am hoping it will help you too. Mr. Haworth made it clear that as long as the article is in its entirty I was free to share it with my followers! 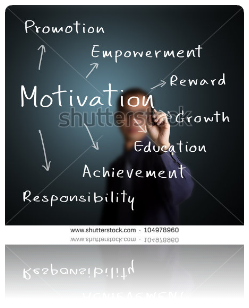 Here is his Super Simple Success Tips For Employee Motivation. Focus on ensuring what's important to them and, where it is in your control, make sure it's delivered, without fail to build their trust in you. Let your people take the actions on what you want them to deliver and trust them to do it as well, if not better than you. Encourage and stimulate them to try more, rather than bore them and they will be motivated to stay and deliver for you. Use delegation as a value-creating option to free your time as well as create valuable learning activities for them, growing their opportunities for the future (and more effective team). Manage less, partner more. Create open and balanced relationships where you value and respect each other, working as partners. Show you really hear the words they say to you, by the follow up actions you demonstrate and a real interest in their contributions. Whatever and however you do it, you will find motivating your people all the easier when they trust you - and you them too. It's OK to have fun! You can encourage this by taking part and providing the resources. The easiest way to have fun, is to make the time to laugh together. t's cheap and cheerful and quick. By ensuring that you take the time to thank people authentically for their contribution you will see them respond. Ensure that you respond to the requirements within your people to have appropriate reward structures – if you do the work, this does not always mean additional financial cost. 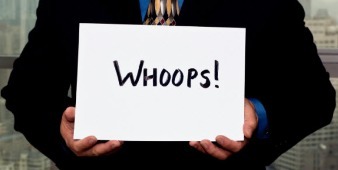 5 Mistakes New Managers Make! ​Over the years I have observed many new managers and while they do some excellent things right out of the gate there are some mistakes that they make along the way. New Managers think they have to make all the decisions. Trying to make every decision will only turn them into a micro-manager. Strong leaders know there are numerous decisions that can be made just as well by others, and there’s no better way to allow others to develop their leadership skills than by letting them make decisions. Many managers think they know everything. Regardless of how smart you may think you are, nobody wants to work for (or be led by) someone who comes across as a “know-it-all.” Strong leaders know there is always more to learn, and they actively seek out new things to learn each day. Leaders are leaders 24/7, and one of the easiest ways to undermine their ability to lead is by being one person while leading and a different person at other times. Some Managers thinks its all about them. I am sorry to disappoint you but its not. It’s about the team. There is no need for a leader if there is no one to lead. The measurement of a team is best seen in the sum of the results of the people. If the results are greater as a team than they are individually, then the leader is doing what they’re supposed to be doing. 5. Being afraid to lead when it’s time to lead. Few years ago I came across this article by Dan Rockwell which I believe captured the power of learning and succeeding from failure very eloquently so I thought to share it with you. 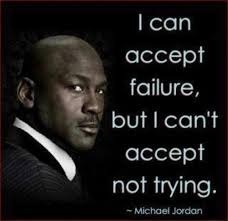 So How to fail well and not fail miserably? Don’t overreact when you fail. It makes you look weak and insecure. Don’t pretend everything’s OK. That makes you look disconnected and out of touch. Take responsibility don’t blame. People respect responsible leaders. Accept your limitations while committing to improving them. No one expects you to know everything. They do expect you to improve. Maintain positivity. Getting down on yourself and others won’t take you where you want to go. Leaders press through failure into the future. You’re done if you don’t frequently get the job done. Keep successes in the spotlight by highlighting the contributions others make. Build and fuel momentum. Momentum makes failures seem smaller. Failures are inevitable and seldom final. However, nothing sustains your credibility if you consistently fail. Therefore, you’ll go farther if you adopt a “failure philosophy” that keeps you and your organization leaning into the future rather than stuck in the past. ​Whenever someone mentioned my beloved Ottawa Senators, to me it was synonym with, the greatest captain in our history - Daniel Alfredsson or Alfie as his friends, teammates, and fans call him. I am very passionate about my hockey and often times people are surprised how a person who doesnt look like a typical hockey fan is passionate about the game and the Ottawa Senators. Part of the reason why I am so passionate has been Alfie. As our captain he was the best player on ice for me, he was a classy individual, well spoken, and when the game was on the line or we needed a leader to step up it was often our Alfie! I have read multiple stories from people on his sense of compassion and how thoughtful he was. 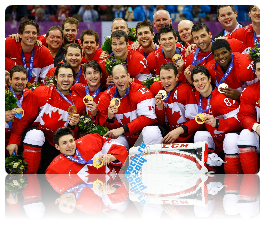 To me Alfie was the best hockey player and my favorite hockey player! ​​The first hockey jersey I could afford to buy was an Alfie jersey. I was so proud of it and every time I looked at it it brought a wide grin on my face because it brought memories - memories that I cherished and absolutely loved! When I moved to Toronto I would wear it often - and take alot of flack for it - but wore it with pride. I loved listening to TSN 1200's Steve every morning because I knew we atleast had one thing in common - unconditional love of Alfie. I badly want my Senators to win a Stanley Cup and I know it looks like a long shot now but it was very realistic few years ago. The chills I would get by imagining Alfie hoisting the cup often moistened my eyes. 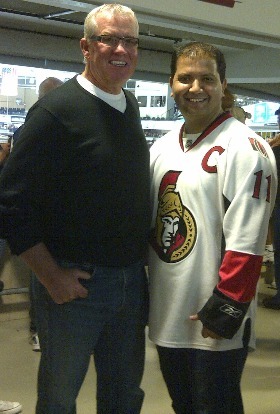 To me my beloved Ottawa Senators was Alfie and Alfie was my beloved Ottawa Senators. 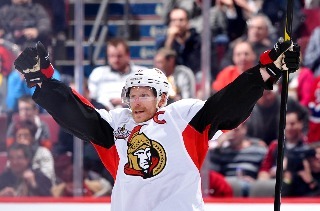 On 28 June 2013, when Bryan Murray confirmed that he had been informed by agent J. P. Barry that Alfie "is committed to play next year for the Senators" I was ecstatic. The previous season we had surprised the hockey world by eliminating Montreal Canadiens in 1st round and giving the powerhouse Pittsburgh Penguins run for their money in the 2nd round. There were alot rumors that Ottawa was in talk to land a star top 6 forward(later turned out to be Bobby Ryan) and another top 6 forward (Clarke McArthur) to build on that success and turn Ottawa into an elite team - once again. I thought if Alfie could to play one more year after this he could hoist that Stanley Cup as our captain that I dreamed about. Then on the night of July 4th I was getting ready for a business trip to Montreal with my Dad when I heard the rumblings that Alfie might sign with another team. I did not put any stock into it because I thought he had deep roots in Ottawa, had accomplished so much here, is so well-loved by people in Ottawa, and more over just couple of months ago he announced on national US radio show that if he will play again it will be with Ottawa. The next day I and Dad were on our way to Montreal and I was pumping gas on Donlad and St. Laurent Sunoco Gas station in Ottawa when I received a tweet from Darren Dreger of TSN just before 10:00AM confirming that Alfredsson had agreed to play with Detroit Red Wings. My heart sunk. The reason I remember it so vividly is because I felt part of me had been ripped. July 5th 2013 is the day that I went through all 5 stages of grief during our 6 hour trip. At first I kept denying it to myself that it was not possible. My Alfie - Our Alfie - couldnt do it. Then I was angry. How could he do it, after what the city and the organization did to him, how could he leave like that etc etc. Then I started to reason trying to come up with a silver lining in all this, looking at positive side, convincing myself that everything happens for a good reason but I could still not bring myself to terms with it. I was then depressed. Not knowing what to do, feeling sorry, sad. And finally I accepted and on our way back I had to remind myself that I had to move on. Some people made fun of me how I reacted that day, some still do, and some of you might start after reading this but I am ok with it. I am a passionate guy, a loyal guy, and when I get passionate and loyal about something (which doesnt happen very often) I form a deadly combination passionate loyalty. As days past I felt cheated, I felt wounded, and I felt betrayed. I was sour and I was angry. And while I can honestly say I never hated Alfredssson and still had respect for him as player my love for him started to erode and confidence in his leadership crode. I started to dislike Detroit Red Wings and after Stinking Toronto Maple Leafs the Wings were the team that I wanted SENS to defeat the most - although after SENS missed the playoffs I cheered for them to win a cup not because I loved Alfredsson like I did but because I wanted to great soldier of the game to realize his dream. I never called him by his nick name again, the jersey that I was so proud of hung in the closet in our Ottawa home and I never put it on once after - I briefly thought of "getting rid" of it but my younger brother who is another passionate SENS and Alfredsson fan objected. ​They say time is the best healer for any wound. As time passed the "wound" started to heal. The other best healer is to right the wrong. 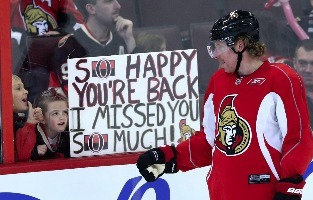 And earlier last week it was announced that Alfredsson would retire because of a bad back. As the details of retirements were made public my love and passion for him started to rekindle. And for that Alfie, I love you again! You are Alfie to me again and I have asked my family to bring my jersey with them today which I will proudly sport (once again) the entire weekend! Thank you for coming back and welcome home - where you always belonged! *Alfie has never admitted that leaving for Detriot was wrong - not yet.